Nokia released a whole slew of new phones (four of them to be exact, the N96 among them) and also unveiled the Touch UI and a couple other odds and ends that had to do with Ovi. So let's take a look at the newest member of the Nseries product line: the N78. In a nutshell, the N78 is a middle-tier candy bar with A-GPS, 3.2 megapixel camera (+Carl Zeiss), WLAN, HSDPA 3G, and - get this - an integrated FM transmitter. More inside. Looks like this will be Nokia's first phone that prominently features the (formerly Beta Labs) Location Tagger, software that allows you to "geotag" or add location-based GPS coordinates to your images. The N78 handles this automatically and allows you to view your images on an onboard map. It's a nifty addition although relatively minor. Basically a series of horizontal lines with no obvious gaps in between. Sure it looks cool but the jury's out on how functional it is. 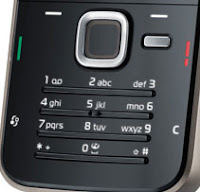 And it also appears that Nokia isn't going to stop with this "squish the Call/End buttons to the sides" ridiculousness any time soon, if the N96 and N78 are anything to go by. The good news is the C button is no longer right next to the End key so there won't be any more annoying accidental keypresses a la N81.